The Triumph Street Triple R has been the choice of road-going hooligans since 2007 and continues to dominate the middleweight naked market, albeit with a now revised 765 triple motor. The Street Triple R appeared in 2008, before receiving a facelift and new aggressive, angular headlights in 2011. Both the standard bike and the R model were then again replaced in 2013 to become the bike we see described for sale below. With superb handling, light steering and masses of feel for grip, the Street Triple R wasn’t just better than its rival nakeds, it was one of the best handling bikes on the market. The tubular aluminium frame was made from fewer component parts – just eight instead of 11, for greater strength and ease of assembly. The numberplate hanger can also be quickly removed via three screws and a block connector, which is handy for trackdays. Alongside greater ergonomics, the last iteration of the 675 Street Triple R also made a respectable 105bhp at 11,850rpm alongside 50ft-lb at 9750rpm. Although power and torque remain the same as before, the bike got new fuel-injection throttle bodies, ECU settings and a revised, longer first gear, which hampers the wheelie-inducing acceleration slightly. What’s more, at its launch, Triumph claimed these changes improved fuel consumption by 30% at town speeds and 12% at 50mph. The mpg remains the same as before when you’re going for it, though. 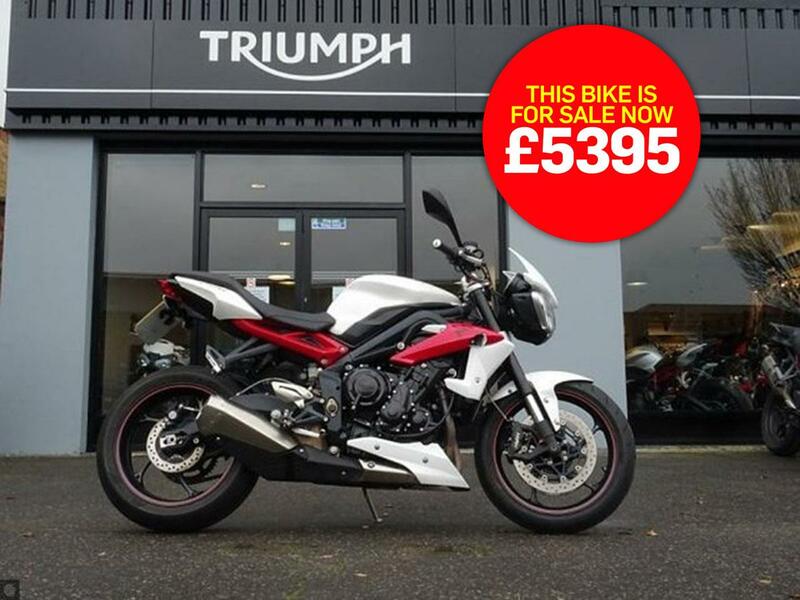 "This 675cc Triumph Street Triple R looks great finished in white with just 6150 miles on the clock. The manual six-speed bike first registered in 2014 (64 reg) also has a Data Tag and immobiliser. "It is fitted with an Evotech tailtidy and machined alloy levers. For more details please call Triumph East London, your Triumph dealer for East London and Essex on 01708 752111." Find a used Triumph Street Triple R for sale.